Last August my husband and I embarked on a no spend month challenge. We allotted ourselves $300 (jointly) in spending money. We had to make that $300 count: all our groceries, gas and incidental spending had to come in under $300 for the month. Since we had never done this kind of thing before, I just didn’t know how hard it was going to be. Gas money for my husband’s 50 mile a day commute was going to take a big bite out of that $300, so I knew my grocery spending was going to need to be really tight to make our goal. And that’s what was on my mind when I found myself standing in the dairy section of the grocery store, looking at $2.00 gallons of milk and $4 quarts of yogurt. Now I can do basic math: for the cost of one quart of store-bought yogurt I could make eight quarts of homemade yogurt. I decided to try making yogurt. It worked! After sorting through various recipes, I found that most followed a common process: I looked on the internet and found lots of advice about yogurt making, and a few ads for yogurt makers that ran about $30-$50 or more. I am not of fan of uni-taskers in the kitchen, and dedicated yogurt makers rank pretty high on my list of yuppie-hippie objects I can do without. Heat milk to 180 degrees. Cool milk back down to 110 degrees. Add starter culture (½ cup starter yogurt per ½ gallon of milk). Transfer yogurt mix to clean containers (large or small – doesn’t matter). Keep yogurt at or around 110 degrees for 7-8 hours. There are lots of ways to do this, but since I have a warming drawer (talk about yuppie-hippie, huh?) I pressed that into service. To get my yogurt started, I used a little single serving size container of full-fat plain organic yogurt that said “live and active yogurt cultures” on it. I think it was Nancy’s brand. It was a dollar at the co-op. The ingredients in the yogurt were milk and a bunch of cultures that started with Lactobacillus and Streptococcus. I heated my milk up to 180 degrees in a large stainless pot, then just let it sit partially covered until it was down to 110. This took an hour or so, but I had started with a gallon of milk. Smaller quantities would cool off more quickly. I stirred the yogurt right into the warm milk, then ladled the mix into clean out-of-the-dishwasher glass pint jars. I loosely lidded them and moved the jars into my oven warming drawer, which I had set to 110 degrees. I had a thermometer run into my warming drawer, and I periodically checked to make sure the temperature was staying in range. I set a timer for 7 hours and when it went off I moved my jars into the fridge. When the yogurt was cool we tried it and it was great! The flavor was tangy but not sour, and the texture was pretty smooth. The one problem I encountered was that the starter yogurt didn’t melt into the 110 degree milk as I expected it to. Instead it stayed clumpy. I have since solved this problem by whisking my starter yogurt with about a cup of 110 degree milk until smooth, and then stirring this mix into the rest of warm milk. The other refinement I have made is to strain the yogurt as I am ladling it into jars. I find that the heating to 180 degrees can cause some protein coagulation and I get a smoother product if I strain out any little bits of skin that have formed on the milk. It’s a pretty simple process. Do it once and you’ll get it; do it twice and you’ll be a pro. Once you have a batch going, you just need to remember to save your last jar to act as a starter for your next batch. It seems to keep for at least 3-4 weeks. We’ve certainly never had a jar go off on us. I sometimes make 2 gallons at a time in order to turn half into greek-style yogurt (thicker) or yogurt cheese (thickest). After the yogurt sets and cools, I strain it by dumping it into a paper-towel lined strainer set in a large bowl. I cover it with plastic wrap and after several hours I have really thick yogurt. If I stir it and let it keep draining overnight, it’ll become a nice soft cheese, similar to cream cheese and a great substitute for sour cream. The drained whey is good for breadmaking and lacto-fermenting veggies. 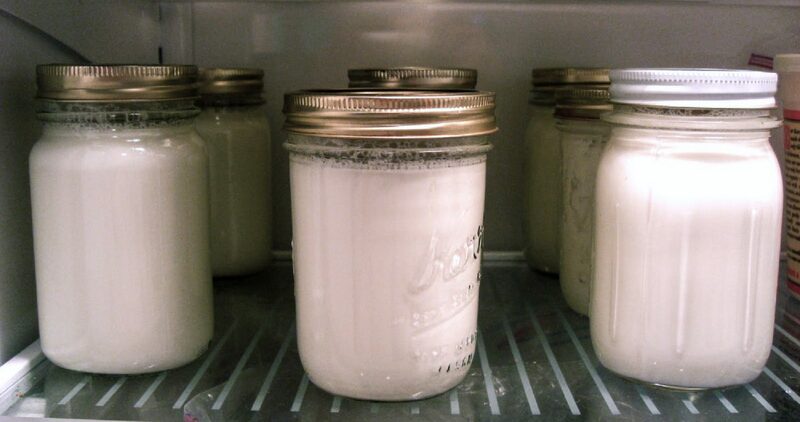 Making yogurt turned out to be a great addition to our expanding set of suburban homesteading tools. It’s so easy and such a great way to use bargain milk (Organic milk goes on loss-leader sale? Friend with a goat gift you with a few gallons of goat milk? Solution: yogurt!) and it tastes better than commercial yogurt. It’s been 5 months since our initial no-spend challenge and we’re still making our own yogurt. In fact, when we embarked on our second no-spend challenge this month, one of the first things I did was make a big double batch of yogurt. It’s a great way to diy, save and bring production back to the home. I doubt we’d ever go back to store bought. I put my "yogurt" in a crock, put it on a heating pad at medium temp and cover with a towel. Have you tried making crockpot yogurt? Back when I was single, 30 years ago, I used to make yogurt in glass peanut butter jars (all the PB was in glass then, not plastic). I had a gas oven with pilot light and that worked fine. Then my boyfriend (now husband) gave me a yogurt maker. I still use it. It is pre-yuppie and I am not so sure it is hippie either, though we are "old hippies" ourselves. Yoghurt is a subject I've been interested in for a while and believe me, I've tried lots of different methods with varying success! I was given a yoghurt maker a while ago and I find its so easy to use. Its really just a thermos flask, so any wide mouth thermos that fits a jar of yoghurt would do the job, it just means that its easier to keep the yoghurt at temperature. I don't worry too much about the timing, it can take longer than 7 hours if it gets too cool, I just take it out when I remember and check that its thick enough. I also use powdered milk, which I know has damaged proteins etc, but is so much quicker than pastuerising milk in a pot, creates fewer dishes and is cheaper. Good tip about straining the pastuerised milk though, I noticed that coagulated protein too, it did put me off the real milk yoghurt a bit. I'm not sure that the yoghurt whey can be used to ferment veges as it is bacteria that should be kept warmer than room temperature, cheese or kefir whey is normally used as those bacteria grow around room temperature, have you tried it for fermentation? One last thing, I find the yoghurt maker is not a one-use appliance, as I also use it to make cream cheese (ok a two use appliance then!) and the one I have is only $20, so if you weren't on a no spend challenge, its really quite reasonable. Farmer liz – I use the whey to inoculate brine for lacto fermenting veggies. Works great that way, as a jump start. Also works excellent as a sub for water in bread to keep homemade bread fresher longer. I put mine in the oven with the light on wrapped in a towel and it works perfectly fine. I came across your site when I was reading up on lacto-fermentation and I can’t seem to stay away now! I ordered my ReCap lids (no wide-mouth yet) and will attempt to make some veggies when they arrive. However, this last weekend I attempted the yogurt above. I really liked it! I used 1% milk so I think that might be the reason why mine didn’t thicken up to the degree of store-bought Greek yogurt. I let it drain for six hours. Also, the taste was different from GY too- but in a good way. It was a lot like ricotta cheese instead. I had some this morning with a bit of honey and granola and it was GREAT! The whole process was quite easy and straightforward. I am sure that this will be a staple in our house-hold from now on. Thanks for all your excellent articles! Also goat milk yogurt is awesome! I also use a stainless steel bowl & colander lined with coffee filters ( lint free and cheap) I like my yogurt Greek style so I let it drain for 8 hrs plus. I’m new at fermenting , figured I would start with cabbage and real ginger -ale and work my way up to Kombucha ! Just wanted to jump in on this old conversation and add that I make fresh yogurt every week and use a dehydrator. After heating the milk to 180, cool it to 110-115, whisk in your starter culture, then put it in a sanitized ceramic dish w/lid and place in the dehydrator at 115 degrees for about 4-6 hours. After that, transfer to fridge to halt culturing. Works every time. I always strain and it makes amazing greek-style yogurt. Also, never use store bought ultra pasteurized milk…it has a good chance of not culturing. The best bet for success is to find a local farm store and purchase their milk. it is usually low-pasteurized and possibly not homogenized…it makes the best yogurt. While I’m bringing the milk up to 180, I stir it with a whisker throughout the heating process. By the time it’s hot enough, there are light peaks on the milk. Adding the air makes the yogurt so much creamier and it helps to prevent the film from forming on the top of the milk. I also whisk it occasionally when dropping it back down to 110. I’ve been reading all your posts about eating from the larder and no-spend months. They are so inspiring! We’re expecting our 2nd kid and I’m gonna be stating home with them. It’s gonna take some serious cuts financially and food is a big one! We’re growing more food this summer thanks to some of your tips too! I’m wondering, can you tell me where you find loss leader deals? Do you just happen upon them or has anyone found a website that helps you find them? I’m curious about freezing homemade yogurt. It would be handy to make a large batch, portion it out and then thaw it weekly. Does it suffer in terms of nutrition? Texture? Taste? I started making Yogurt from The Frugalgirl.com there were many recipes i found even one to be made in a crock pot, but this one uses less yogurt than yours and half the warming time. I do mine in a ice chest with hot water would be nice to have a warming drawer. I love your tips and music.